Sellers who want to sell their home in the quickest time possible, at the highest possible price, will want to review these steps with their real estate sales representative for an optimum sales experience! 1. Declutter, clean, stage. You’re going to have to completely clear out of your place when you move anyway, so it makes sense for you to deal with all your “stuff” well before you put your home on the market. Once you’ve removed all your personal mementoes and thrown out or packed up as much as you possibly can, clean until it gleams. In fact, consider having the home professionally cleaned — fresh carpets and sparkling windows can cast a positive light on every room. Remember, the more move-in-ready the home looks, the more appealing it will be in relation to the asking price, resulting in a quick closing. Finally, talk to your real estate sales representative about staging services to add the “wow” factor in elevating your sales appeal! 2. Paint and repair. Every home has small quirks and repair jobs that we know we need to fix at some point, but just haven’t gotten around to, as well as walls that would benefit from a fresh coat of paint. Consider this the time to roll up your sleeves and tackle any small DIY repairs, or call in the pros for the bigger paint jobs and repairs. Prepare to be amazed at the difference that a few coats of fresh, neutral paint make in buyer-appeal. 3. Price it right. This is where dealing with an experienced real estate professional is crucial. In addition to analyzing the distinct features of your property, your real estate sales representative can show you a comparative market analysis, which will confirm the prices of similar, recently-sold properties, and help determine a price that works for your specific home within the current real estate environment. Remember that sentimental value doesn’t add up to dollar value, so be wary of over-pricing based on how you feel about the home, or in fact how much you have spent in renovations, as you won’t necessarily get your dollar value back in all cases. 4. Market it right. Follow your real estate representative’s lead on what goes into an appealing listing, and work together to ensure all the special features of the home and its location are detailed. Ensure the professionally-worded listing materials are supported with high-quality visuals of both the inside and outside of the home. 5. Step back and let your representative do their thing. Make yourself — and the rest of your family (including your pets) — scarce during open houses and showings. As much as you would love to be a fly on the wall, potential buyers simply don’t feel comfortable taking the time they need and asking the questions they want when the homeowner is within earshot. Make it easy for the home to be shown by keeping your place in show-ready condition and having a plan to quickly vacate for an hour or more should you get a call that an interested party wants to view your property with short notice. Spring is peak home-buying time. If you’re in the market for a new home this season, get a jump on your competition by ticking off these tasks before even beginning the home-hunting process. Obtain a copy of your credit report. It’s always wise to check your credit standing through one of the free credit-reporting services once a year, even if you’re not in the market for a loan, just to be sure the report is up-to-date and accurate. In the event it contains any errors or omissions (e.g., closed charge accounts that appear as available credit or repaid loans that show up as outstanding), you’ll want to get those mistakes cleared up before they slow things down when you do need a loan, or worse, ruin your chances of obtaining a loan altogether. Get pre-approved for a mortgage. And make sure your real estate sales representative knows! By getting pre-approved, not only will your representative be able to target properties that fit your budget, you’ll know that financing won’t be a stumbling block when you do find that perfect home. Also, as a pre-approved buyer, you can offer sellers a quicker closing, which can give you the edge over competing buyers who have yet to secure their own loan approval. Be available. Make sure your real estate sales representative knows the quickest way to contact you as properties meeting your criteria become available. And have a contingency plan ready for viewing properties at a moment’s notice — have a babysitter on speed-dial, for example. Although reading books can seem like a long lost art in the days of digital devices, there still remains something special about the smell of a brand new novel and being able to flip through physical pages. For dedicated bookworms with cherished collections, it can be a struggle to store and display your favorites without a dedicated home library. Follow along for eight ways to stylishly integrate books into any room in the house. This is not just limited to cookbooks. Any books you’ll want to read over a good meal or while waiting for the oven to preheat are just as applicable. There are many ways to add a homey vibe to your space by installing open shelves beneath a kitchen island or along a blank unused wall. Just make sure to keep the books away from appliances so the pages and binding don’t get damaged by heat. As we venture further into fall and winter, many bookworms will want to curl up under the covers with a hot cup of cocoa and a new novel. Keep your reading list at arm’s reach by storing books along a windowsill or stack them up in a corner of the room. 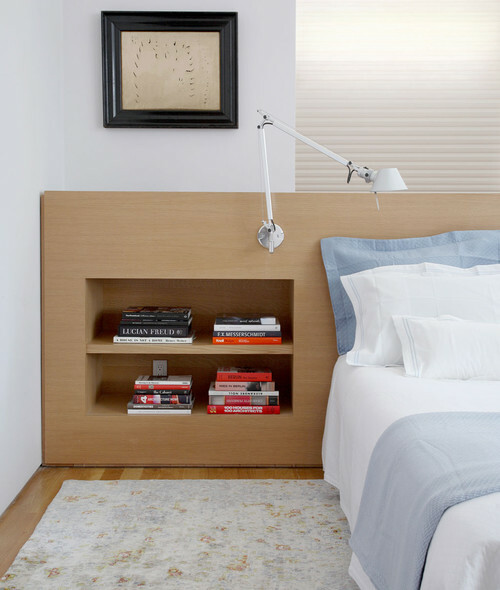 For a more permanent solution, buy a new headboard or nightstand with built-in storage. Fireplaces make a lovely focal point in many living rooms, but can be a hassle to maintain and use. 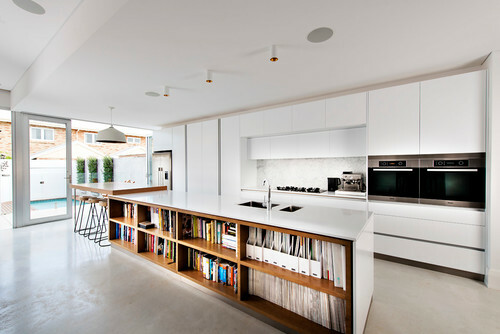 You can breathe new life into this space by cleaning it thoroughly and stacking books in the empty space. The different bindings will create visual interest and bring color to the previously black abyss. One of life’s luxuries is being able to read a good book in a relaxing bubble bath at the end of a long day. 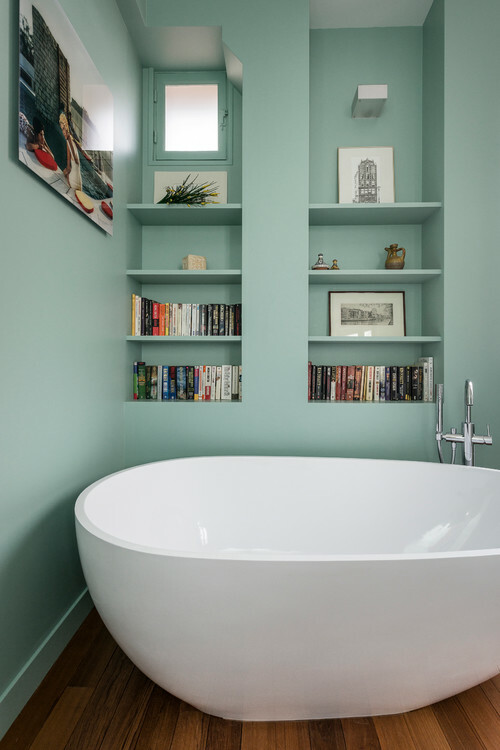 This can be done by building recessed shelves above a freestanding tub. For renters, there are plenty of budget-friendly over-the-toilet storage cabinets that accomplish the same purpose. Be sure to take proper precautions against warped pages caused by moisture with an exhaust fan. In many home offices, the space above the desk goes largely unused. Simply look up for more space. You can create a home for a decently sized collection of books by installing open shelves above your computer all the way up to the ceiling. 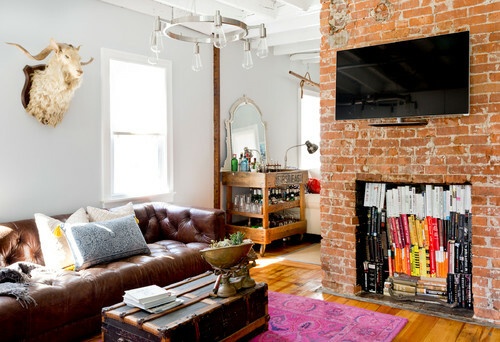 The transitional Philadelphia space shown here illustrates the idea nicely. 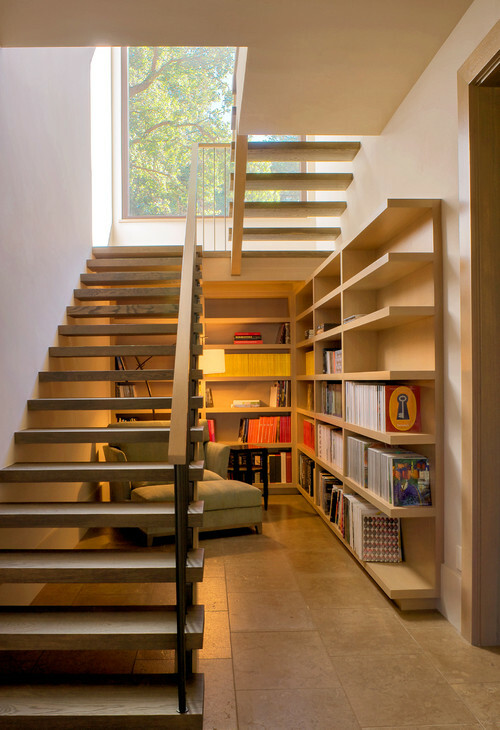 If you still haven’t found the right fit for what to put in that little nook under the stairs, look no further. Bring in an asymmetrical or diagonal bookcase to house your collection or carve out an alcove to recreate a Harry Potter vibe. Bring in a comfy chair or cushions and you’ve got the perfect personal hideout space for the season. This one requires the expertise of a skilled woodworker or architect. Frame any doorway in your home with a gorgeous collection of novels that surround it left, right and above. Add a rolling library ladder to reach the highest shelves and bring rustic charm and character to any space, as seen here. If you’re really unable to squeeze any more space out of your home to store books inside, consider moving outdoors for a unique solution. 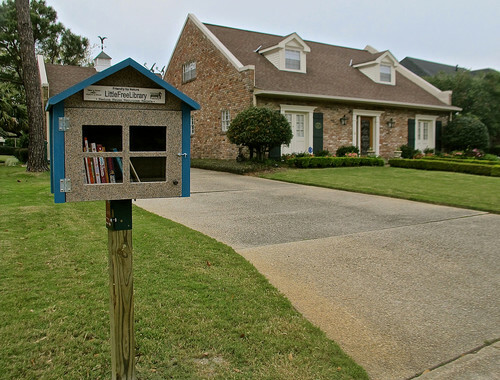 The Little Free Library is a nonprofit organization that seeks to bring communities together and share books with one another through a house-shaped box in their front yard. Fill it with a few of your favorites that you’re willing to share and encourage your neighbors to take one, leave one of their own or both. Although this is not quite a storage solution, it’s a great way to connect with your community and discover new reading material. There’s a decorating guideline that dictates that things displayed in odd numbers, with “3” often being the go-to number, adds depth, looks more natural, and makes arrangements more visually appealing than even-numbered groupings. Three isn’t considered a crowd when it comes to arranging furniture, displaying artwork on walls or positioning contents on a tabletop. In fact, even adding a third colour to a room can change a flat design into something that feels more welcoming. For example, you may follow the 60/30/10 equation when choosing room colours, where 60% is the main room colour, 30% is the secondary colour and 10% is the accent colour. Lighting arrangements also benefit from the power of three. Most rooms need to be lit by one ambient light, along with task lighting and then accent lights, all of which work together to result in a balanced and practical combination.